We have improve online chat system in website and also provide Whatsapp support service (Whatsapp +852 5237-1808). Customer can contact Evinco by phone, email, online chat, or Whatsapp. Few years ago Evinco website migrate ordering and contact related webpages to use https protocol. Now we further migrate other web pages to https, include software information, software online documentation, knowledge sharing, support forum, online chat, to improve the security of Evinco website. Mac OSX version of EasyBilling Invoicing Software is released. OSX version has all the same features and user interface as the Windows version. We will provide update to both Windows and OSX version for future version release. OSX version can be downloaded from following URL. After download, click on the pkg file to start the installation. 2015-09-21 Update: OSX version of ChequeSystem, RoboMail, PhotoX, PhotoPDF and Smart Calendar Software are released. We have already test our software on Windows 10 Technical Preview. We have test with both 32-bit and 64-bit version. The software runs well and we don't see any abnormal behaviour. We expect it can run well in the Windows 10 official release. To avoid any abnormal situation, we suggest you to make a backup on your ChequeSystem / EasyBilling / RoboMail data before performing the Windows 10 upgrade. In the software, click menu "Tools > Backup" and save the backup zip file. Please keep the zip file in safe place. You need to perform backup on every workspace if you have more than one workspace in ChequeSystem / EasyBilling. We've improve our website to follow the Responsive Design. It is now mobile friendly and can be view nicely in Mobile Phone or Tablet. Evinco Software includes CamShot, ChequeSystem, EasyBilling, PhotoPDF, PhotoX, RoboMail, Smart Calendar are now support and compatible with Windows 8. We post articles on Knowledge Sharing column to share our experience on Office Productivity, Online Marketing, etc. Recently, we've revised Knowledge Sharing column with a newly design layout. The new layout shows articles from different categories on the main page. We have setup Youtube Channel and uploaded demostration video of Evinco Software. The video shows the operation of the software, which can help users to have a better understanding on the software operation. The videos also be listed in the "How-to" page of the software. We will produce more demostration video of Evinco software and share in the Youtube Channel. Evinco puts continuous efforts in offering excellent services. We have adapted the content delivery network and offer high-speed download for the trial version of oftware. The maximum download speed can be up to 800KB/S and the download can be completed within 1 minute. 2009-11-21 Get Year 2010 Calendar! We have prepared the 2010 Calendar for you. 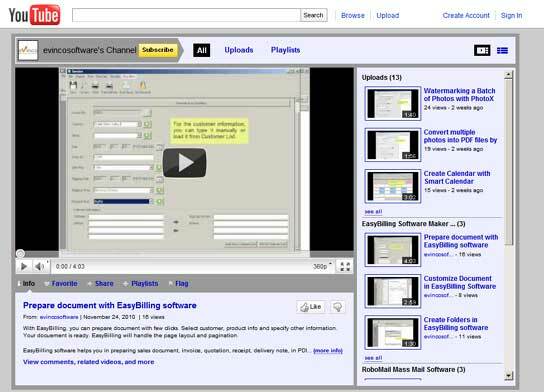 Start using Evinco Software in 2 minutes! Immediately after completing your online purchase, we will sent you an e-mail which contains the license information to convert the trial version into full version. Lost your license? No problem. We've built a web page for you to retrieve your software license. Simply provide your registered email address, we'll email the license information to you. We've finished the upgrade on Knowledge Sharing Column. Gust can post comment to our post and express their views. We also setup a new category "Royalty-Free Photo" which share free photos taken by our colleagues. We've upgrade our Support Forum. User can subscribe to the question and get notification of any reply. Software Industry Professionals prepare a fact sheet about "Buy Software Online Guide". Click to get "Buy Software Online Guide". In this simple guide, you will find out the benefits to buy software online. Software Industry Professionals is one of the world's largest groups representing members of the software industry, with over 2200 members in 93 countries. 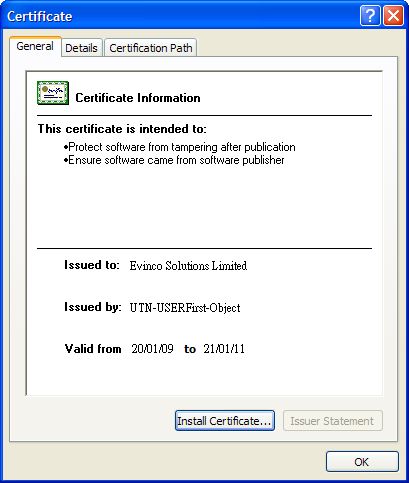 Evinco Software are digitally signed. We are pleased to announce that our software are now digitally signed. Our signed software ensures that you can verify the origin of the software, as well as verify that no one has tampered with it. Chinese New Year of OX (January 26th 2009). 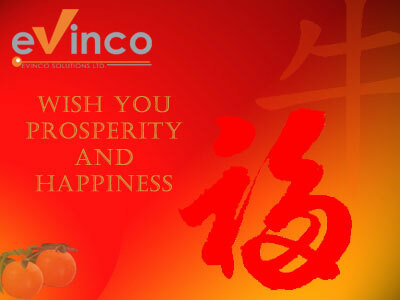 We wish you prosperity and happiness. PhotoPDF Photo to PDF Converter is released. PhotoPDF is a batch processing tool to convert photos into PDF file. PhotoPDF provides two mode of conversion: Batch Convert and Photos Merge. "Batch Convert" convert each photo into individual PDF files in batch and "Photos Merge" merge multiple photos into a single PDF file. The customized settings allow to alter the output. User can specify the paper size, like Image Size, A3, A4, A5 or define by yourself. The output orientation can be chosen between portrait and landscape. And the resolution can be adjusted from 72 dpi to 1800 dpi. PhotoPDF Support BMP, JPG and GIF format. PhotoPDF is only US$39.95. It can be order online via ShareIt! and PayPal. Details can be found in PhotoPDF Product Page. Smart Calendar Software is released. On 26 Sep 2008, Evinco Solutions Limited releases the latest self-developed software "Smart Calendar". Smart Calendar software help you to prepare and generate Event Calendar, you can type your events into calendar easily. Events can be highlighted with background or text color. Calendar can be exported into PDF, EXCEL and HTML format. It can be order online via PayPal or ShareIt!. Details can be found in Smart Calendar Product Page. You can now order a backup cd for US$10.50 when ordering your software in the Order Page. On 19 Nov 2006, Evinco Solutions Limited stengthen customer support services by providing additional communication channel for customer. These communication channel includes: Online Chat Support and Support Forum. Besides online chat, customers can post their questions on the support forum. The URL is https://www.evinco-software.com/forum. On 20 May 2006, Evinco Solutions Limited releases the latest self-developed software "PhotoX Batch Watermark Creator". PhotoX is a batch image processing tool to help create watermark on the images. User can easily stamp an watermark on the photos to protect their intellectual property easily. It can be order online via ShareIt! and PayPal. Details can be found in PhotoX Product Page. Evinco prepares a great 2006 Calendar. Download 2006 Calendar. Knowledge Sharing column share experience from our techncial team on Internet Usage/Computer Knowledge, which help you utilize the IT resources to explore business opportunities. "EasyBilling - Professional Maker of Quotations, Invoices and Receipts"
Another innovative software is developed for SME/Soho user, EasyBilling. It helps you in preparing different "Professional Looking" sales document. Click EasyBilling Software to view details. CatStudio - a feature-rich environment to create Web-based, Movie and PDF catalog. To know more about the unique function of CatStudio, click here. The newly developed mass mail software, RoboMail, is ready. To know more about the unique function of RoboMail, click RoboMail software for details. Have a deep look on the RoboSales System. Click here to download the RoboSales Leaflet in PDF format.